The idea behind the Adorn condiment server takes hosting a party or going out on a picnic to a new level with its sleek design and its easiest convenience. The 5 containers are removable and make the serving, refilling and cleaning easy. Each cup holds approximately 16 ounces, making this large enough to not have to be constantly refilling them every few minutes. The hinged lid helps keep the cold in and the bugs out! Just fill the bottom tray with cubed or crushed ice or simply fill it with water and freeze it prior to using it. Simply, place the five serving containers on top with all your goodies, salad dressings, fruits, and veggies or even ice cream! The unique design helps keep things fresh and cold longer by trapping more of the cool air to stay in to maximize the ice's chilling power. This dish is not a luxury it's a necessity for any outdoor picnic, grilling event or party. It's made of strong and durable crystal-clear plastic and is top rack dishwasher safe, so you don't have to think twice before using it. Make your special event or outdoor eating a day to remember and never allow your food to spoil or get warm before you and your guests even get to take that first delicious bite! ✅ ADORN 5 SECTION CONDIMENT ON ICE SERVER: Starting with this impressive 5 section condiment on ice server with hinged lid! It's a great dish for any picnic, BBQ, party, wedding, social gathering and more! 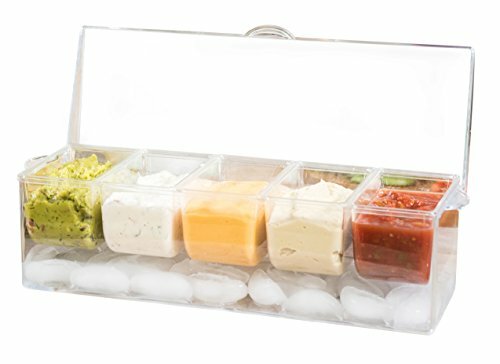 ✅ ICE ICE BABY: Each of the 5 sections are removable to fill the bottom with ice to keep your condiments such as: dips, cocktail products, fruits & vegetables etc. fresh & cool for hours! This design is made to keep cold air flowing throughout the container to ensure the food stays nice and cold for longer periods at a time. ✅ REMOVABLE CONTAINERS: Accessible containers are removable to provide an easy way to replenish your condiments when there just starting to look low. Each compartment holds up to 2 cups (16 oz.) per container. ✅ STRONG & DURABLE: This durable 5 section condiment server is equipped with convenient handles on both sides of the tray. Also, a hinged flip cover is secured to keep your condiments cold, fresh and away from any insects or bugs trying to break in. If you have any questions about this product by Adorn Home Essentials, contact us by completing and submitting the form below. If you are looking for a specif part number, please include it with your message.